A Rabbi and a Priest were sitting together on a train, and the Rabbi leans over and asks, "So how high can you advance in your organization?" The Priest says "If I am lucky, I guess I could become a Bishop." "Well, could you get any higher than that?" asks the Rabbi. "I suppose that if my works are seen in a very good light that I might be made an ArchBishop" said the Priest a bit cautiously. "Is there any way that you might go higher than that?" "If all the Saints should smile, I guess I could be made a Cardinal" "Could you be anything higher than a Cardinal?" probed the Rabbi. 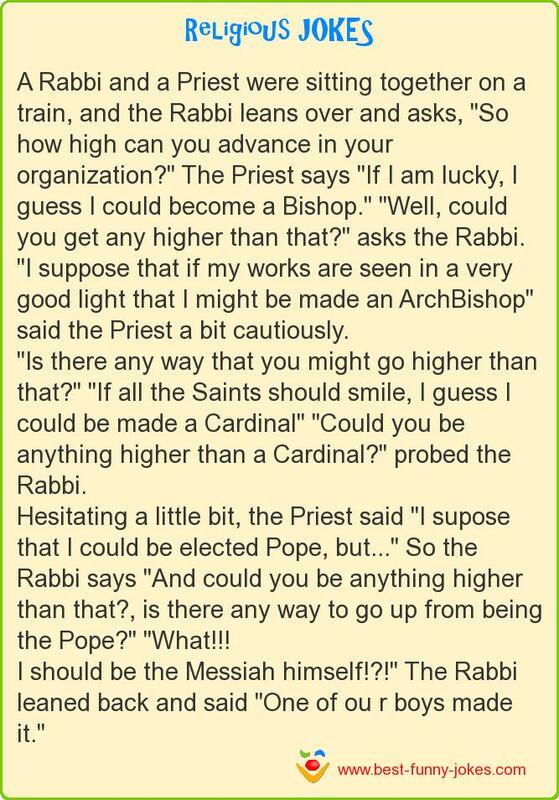 Hesitating a little bit, the Priest said "I supose that I could be elected Pope, but..." So the Rabbi says "And could you be anything higher than that?, is there any way to go up from being the Pope?" "What!!! I should be the Messiah himself!?!" The Rabbi leaned back and said "One of ou r boys made it."